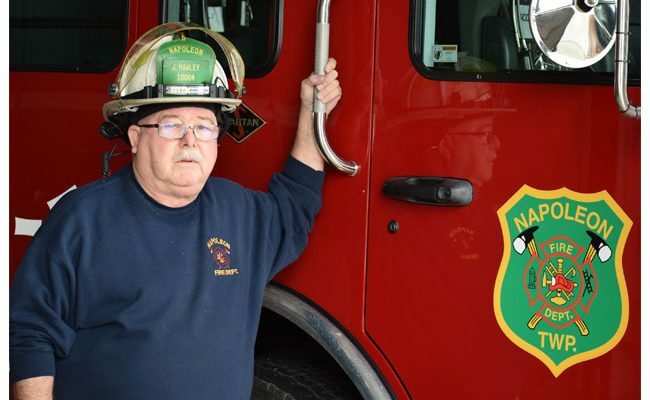 Napoleon Township Fire Chief Jay Hawley, above, has been with the Napoleon Fire Department since 1974. Note the reflection of Hawley above the department logo on the truck. If you ever want to know anything about firefighting or rescue work, there’s no need to go to school. That’s because there is a one-man school in Napoleon Township in Fire Chief Jay Hawley, though he will still tell young firefighters that they still need to go to school. Hawley grew up right in the heart of Napoleon at the four corners and graduated from Napoleon High School in 1968. The Hawley family first lived above Vic’s Food Store on the southeast corner of the intersection until Hawley’s dad, Victor, built the family a new house across from the original fire station next to the post office in Napoleon. That was in 1956 when Hawley was just six years of age. 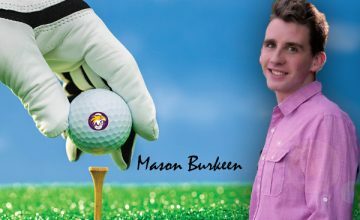 After high school, he joined the Napoleon Township Fire Department as a volunteer and took some course work in fire science and technology at Lansing Community College, but didn’t like the drive. So he quit and went to work for Aeroquip in Jackson and then Ford Motor Company in Saline on the assembly line. In addition, he worked for his dad in the family store. Hawley then was called for military duty and served two years in the U.S. Army, mainly at Fort Riley, Kansas. Upon returning, he decided the assembly line wasn’t for him anymore and decided to just help his dad at the grocery store. Ironically, a fire at Vic’s Food Store may have been Hawley’s big break. It was shortly after that, on April 1, 1974, when he was offered the position as chief of the Napoleon Township Fire Department. He and former police chief Michael Curry were hired on the same day. 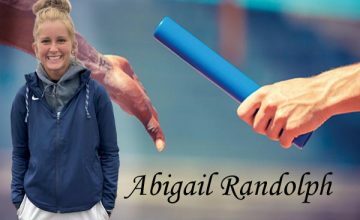 Both were among the youngest chiefs in the state at the time. In 1977, Hawley married his wife, Tonya, and moved back above the store where he still lives to this day. “So I haven’t gone very far,” he laughed. He raised his three kids there as well. Two of his three kids now have children of their own, making him a grandpa as well. 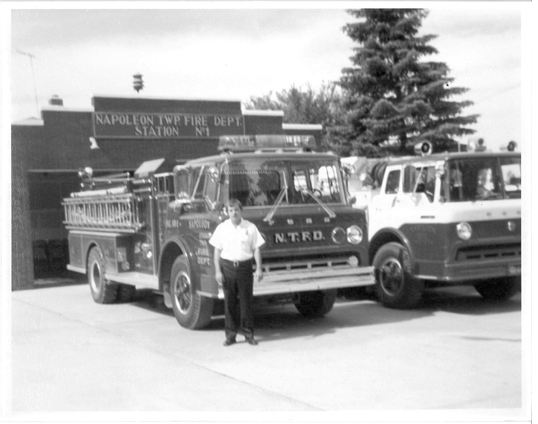 Young Napoleon Township Fire Chief Jay Hawley proudly stands in front of his then-new 1977 pumper truck. To his right is a 1969 pumper. Hawley said the two were financed together for $80,000. It was the first time the township financed fire trucks, he said. Tonya’s parents owned Napoleon Café for many years. “That’s basically how I met her,” Hawley said. Hawley started hanging around the Napoleon fire department when he was a young boy. Hawley actually got to run the department’s radio, legally, at the age of 8. The department had one base station radio and one in each of the two fire trucks at the time. Prior to radio communication, Hawley said all calls came in by telephone. The department’s “official” phones were at his dad’s house and in the store, as well as phones at a couple of the other fireman’s houses. “Somebody would take a call and run up to the fire station and blow the whistle,” he said. They would then write the address of the fire location on a chalkboard so when other firefighters arrived they would know where to go. It was his dad, Victor Hawley, who was instrumental in starting the Napoleon Township Fire Department after World War II. He was one of a few from town who went to township board meetings to promote the fledgling fire department and its needs. They got the board to buy them some equipment and the department put together enough funding to build the original fire station on Austin Road. Before that, the township’s only fire truck, a Model A, was kept at the Sinclair station on the northeast corner of the main intersection which is now a vacant lot. Prior to the township’s first fire truck, any fires would have to wait for a pumper truck to come from Jackson, often allowing a lot of damage to occur by the time the county pumper arrived. “There’s so many things that happened in my tenure here that it’s mind-boggling,” Hawley said. In his early years as chief, he had to do the maintenance on all the fire vehicles himself. “Most of my days were spent on keeping the equipment up and making sure everything was ready to go,” he said. In today’s world, a certified technician must complete all maintenance. Hawley was also the first EMT (emergency medical technician) Napoleon Township ever had. Once word got around on that, the department began receiving many more rescue-related calls and were often dispatched all over the east side of Jackson County. Hawley’s department now consists of 16 certified firefighters and three cadets. The firefighters are referred to as part-paid since there are no longer volunteers. One of them is a regular part-timer who does a lot of the maintenance work for the department. That frees Hawley up to do other things like reporting. “The reporting and paperwork part of this job has probably quadrupled since I’ve been around,” he said. Holding trainings for the Jackson County Fire Chiefs Association Fire Academy is another big part of the job. Hawley often serves as an instructor for candidate firefighters for up to 300 hours. Staffing is definitely Hawley’s number one challenge. That’s followed closely by having enough funding for new equipment. “We have to save for years and years to be able to afford a fire truck. Now they’re so expensive we’ll never be able to save enough money to buy one.” When Hawley started as fire chief in 1974, a new fire truck’s sticker price was $50,000. Today it is $600,000. Which brings up the topic of the township millage being talked about to fund police and fire operations going forward. 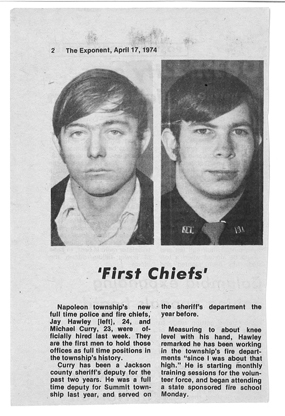 Chief Hawley, left, was hired together with former township police chief Michael Curry on the same day in April of 1974. If Hawley looks a little ragged in the photo, it’s because he had just come in from a grass fire when this photo was taken. He said he didn’t have time to clean up. One big reason why additional funding is needed in the fire budget is that people are demanding more in today’s world from the fire department. Nonetheless, Hawley says it will be a tough sell to the people of Napoleon Township. 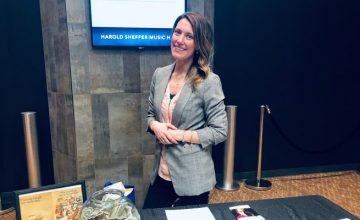 As hard as it is to find and pay part-time staff, having a good staff that always does their best to help people when they can’t help themselves is what Hawley is proudest of. “My dad instilled that in us,” he said. Hawley also feels a big sense of accomplishment for the building the Napoleon Township now has. Hawley is also proud of being on the original 911 board to get central dispatch started in Jackson County in 1975. When he eventually retires, Hawley says he’ll miss the camaraderie of all the firefighters and seeing the people that he’s helped over the years. Who is the IrishHillsLive.com? Click here to learn more! Nice Legacy Jay. All you hard work certainly has been a blessing for many Napoleon residents. Thank you for your dedicated service. Nice job dear friend. The old man (Vic) would be proud.